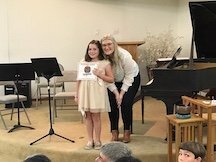 We love for students to participate in our recitals! Location: Unitarian Church-15980 Blossom Hill Road, Los Gatos, CA 95032. 2-7 pm. Students should play two contrasting pieces or one longer song that showcases what they have been working on. Limit to 3 minutes total time per student. Students sign up for a 1 hour time slot (They don't have to stay for the whole event) For example a group of 18 will be from 2-3 and then 3-4 and so on. Reception area will be open throughout in another room and on the deck with light snacks and baked goods. Students should be VERY well prepared. I would suggest having their songs picked out 2-4 weeks in advance and to time them prior. Some even will know now what they would like to work on for the recital. We have two recitals a year; one in May and the other in December. Please arrive at the start of the hour that you are participating in and plan to stay that whole time to support other students. No food or drinks allowed in recital hall. Reception will be open throughout in the other hall and outside deck.